Disbursement Type The name of the disbursement. Default Rate* The charge rate to the client. Cost Rate* The cost rate to your company. Includes GST This determines the cost/charge rate extension.A disbursement can be entered as inclusive or exclusive of tax. Reports in Abtrac show all dollar values (time and cost) as amounts excluding sales tax. If ‘Includes GST’ has been ticked the expense can be entered as it was incurred, which usually makes more sense for the person entering it.The value shown in reports will be based on the entered amount – less tax. Employee Disbursement? This determines whether this disbursement type is available in the Employee Disbursement entry screen. Reimbursable Disbursement? This determines whether this disbursement type is included in the Reimbursement of Disbursements screen and reports. Disbursement Group This is really just for internal use, only the Disbursement Types report from this screen includes Disbursement Groups. GL Account This is used with the Abtrac Debtor Upload – which links your invoices to your accounts package: MYOB, Xero, QuickBooks etc.If you have a multiple invoice line upload, and you generate invoices automatically then you might find it useful to include the expenses code from your accounting system for your disbursement types. This will then export any disbursement lines to an expense code, rather than the default revenue code. Employee Reimbursement based on* The options for reimbursement reports are: Cost, Charge, and the Amount as Entered. Within the disbursement entry screens you can adjust the default rate (value) which will also update the charge extension. 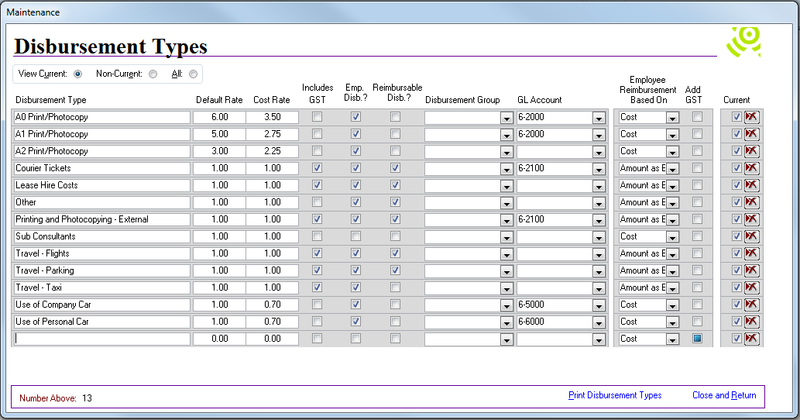 However the cost rate is fixed and not editable from this screen. For disbursement types where the rates are unknown and can vary (such as flight travel) we recommend entering the default and charge rates as 1.00, and setting the employee reimbursement rate as Amount as entered. This will ensure your numbers in reports and reimbursement forms remain accurate. This entry was posted in Administration Settings, Time & Cost and tagged debtor upload, disbursements, invoices by Jen. Bookmark the permalink.